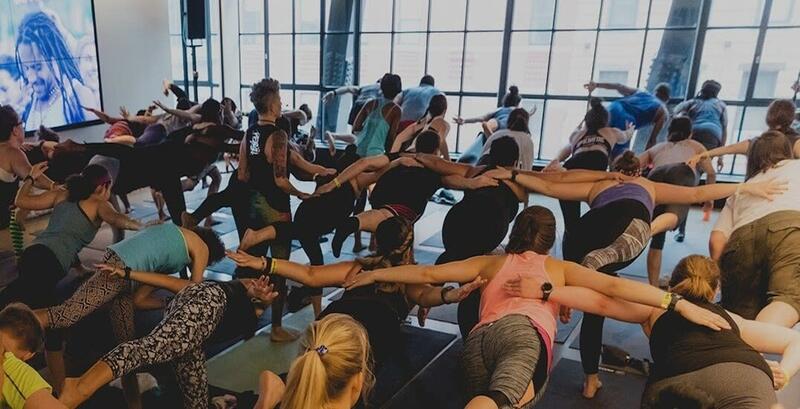 Yoga doesn't have to come with the baggage of added costs and hidden fees the way gyms often do - especially come summertime. Ease some of the stress that comes with subway delays and a busy NYC social life. 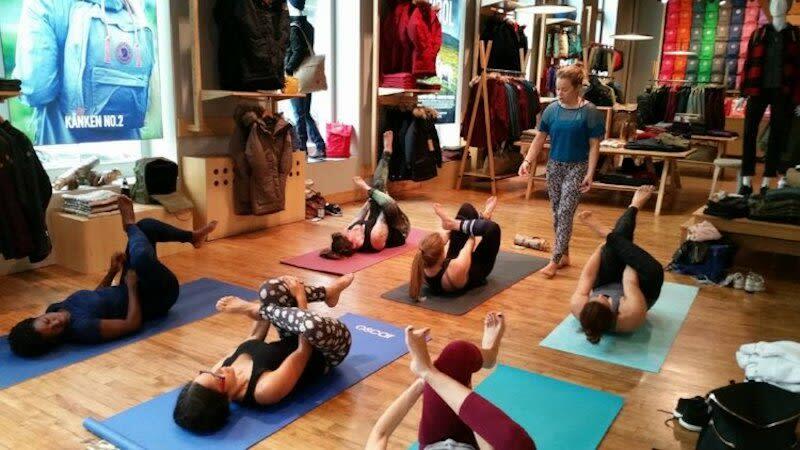 Practice mindfulness and self-care any day of the week at these free yoga classes around the city. Plus, check out our list of free yoga classes coming up so you can plan your next zen moment. 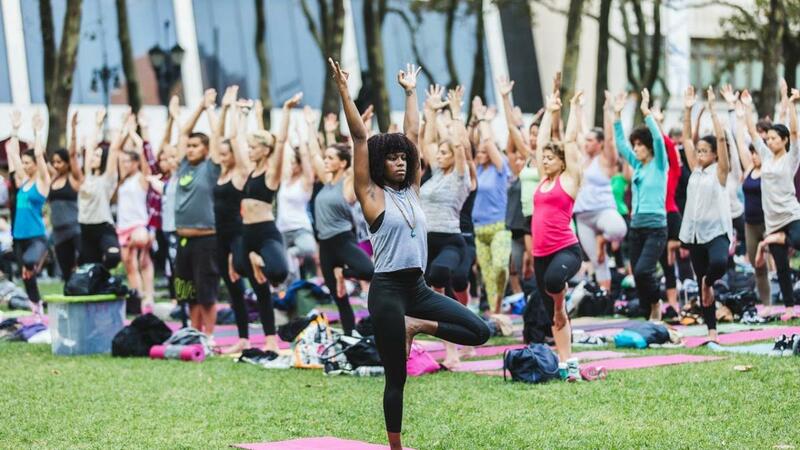 Suns out, sun salutations out at Bryant Park this summer! The 2018 yoga season is made possible by the generosity of KeVita®, a leading manufacturer of fermented probiotic and kombucha beverages. A supporting sponsor, Gaiam, a yoga, fitness, and wellness brand, will donate 1,200 yoga mats for participants to use throughout the season. The mats are provided free of charge but collected at the end of the session. Days + Times: Twice-weekly classes, TUES 10AM - 11AM, THURS from 6 PM-7PM. Sky Ting is a neat boutique yoga studio spread out across 3 locations in Chinatown, Tribeca, and Williamsburg. All three studios offer donation-based yoga classes taught by their newest instructors nearly every day of the week. Proceeds from classes go to the organization of the mentee's choice. Support a good cause + a new yoga teacher! Dates + Times: MON - SUN except for Wednesdays. See a list of classes offered here. Get your Wednesday and Thursday mornings off the ground right, but starting from the group up at Washington Sq. Park with some early morning flexing. 8:30 a.m. is the perfect time to clear your headspace with a free stretch - plus, it's perfect for kids. Stretch out by the water in The Battery with two perfect times for weekday and weekend relaxation and breath practice. Sundays you can warm up for the week ahead and on Wednesdays, squeeze in some post-work movement in the evening, all for free. 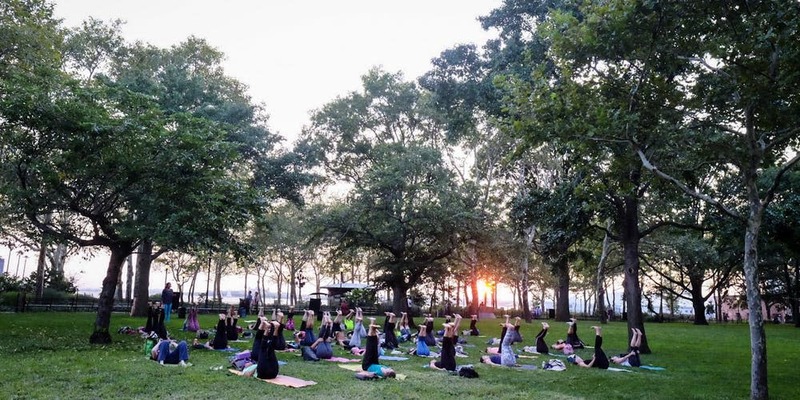 Hosh Yoga in Brooklyn exists to serve the community through yoga and meditation classes as well as youth + senior wellness programs across NYC. They are a non-profit whose main focus is their students and you can stop in to see what it's all about! 12 St. Marks Place b/w 2nd and 3rd Ave.
Yoga to the People offers Power Vinyasa Flow classes 7 days a week at the St. Marks location. There is a suggested donation of $10 per class, but no one is turned away. Days + Times: Multiple times a day, 7 days a week. See website for info. 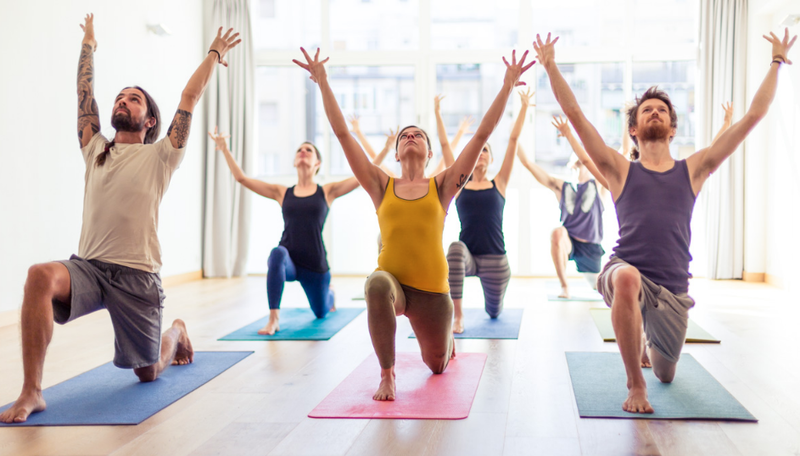 Enjoy community classes at Harlem Yoga for a suggested donation of $8. Classes are offered 7 days a week. Sputnik Yoga offers free classes at a community center in Bedstuy in addition to hundreds of free events across the city. Register for class here or search our site for free Sputnik events! Enjoy community classes at Bikram Yoga Harlem twice a week on a pay-what-you-can basis. This is special because it allows you to practice yoga at a higher level without the mounting burden of costly advanced classes. Enjoy a free yoga class every Friday morning at the epic and futuristic Samsung 837 downtown space. It will definitely bring some zen to your Friday. 1700 3rd Ave. b/w 95th and 96th St.
Storm Yoga offers free classes across the city for all levels. Join their Thursday night class at the Beacon Center. Drop-in to Sonic Yoga's community classes for pay-what-you-can or a suggested donation of $5. They also offer free meditation classes. 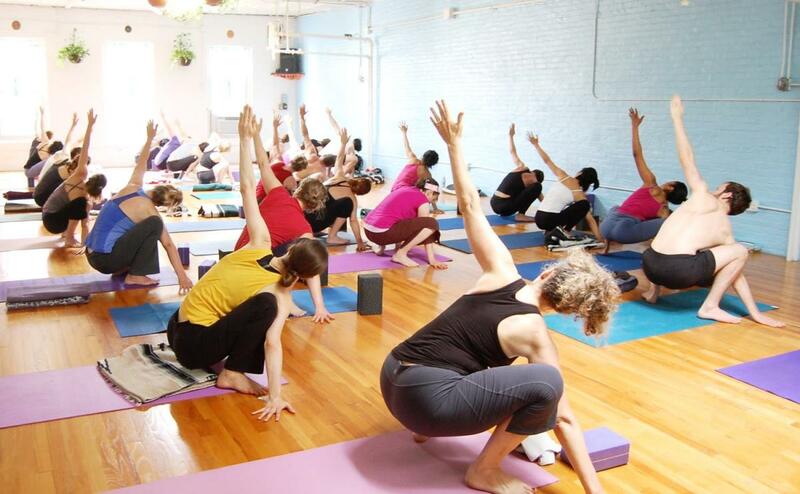 Yoga Agora is a not for profit yoga studio situated in Brooklyn. Select 60-minute classes at this Astoria studio are on a sliding scale or pay-what-you-can basis, which means if you don't have the cash flow, but want to flex, it's possible. You can also participate in a donation-based 75-minute class on the weekends. Days + Times: Monday - Friday at 7am and 2pm. Sat-Sun at 8am. This studio offers free meditation classes and donation-based classes on select community classes Sundays and Mondays. Days + Times: Classes and hours vary. 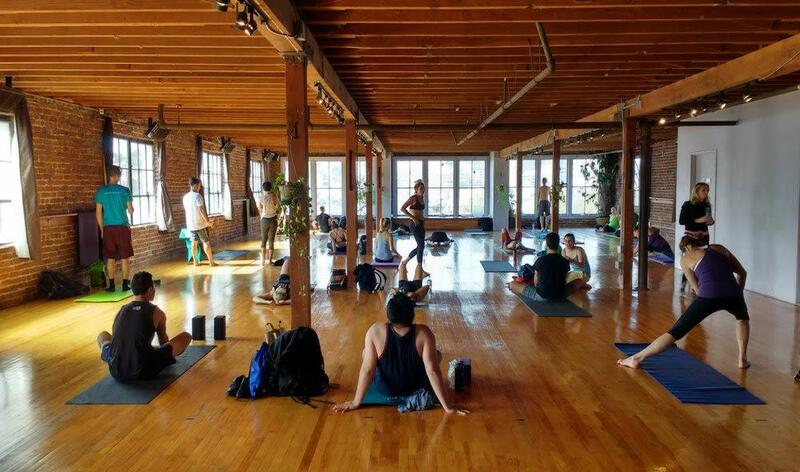 Attend donation based classes at this Brooklyn brownstone turned yoga studio. The levels range from beginning to intermediate, but the instructors are all great and a good alternative if you're struggling to find the cash to practice your flow. Days + Times: Classes held every day. Hours vary. Looking for more free stretch and relaxation? 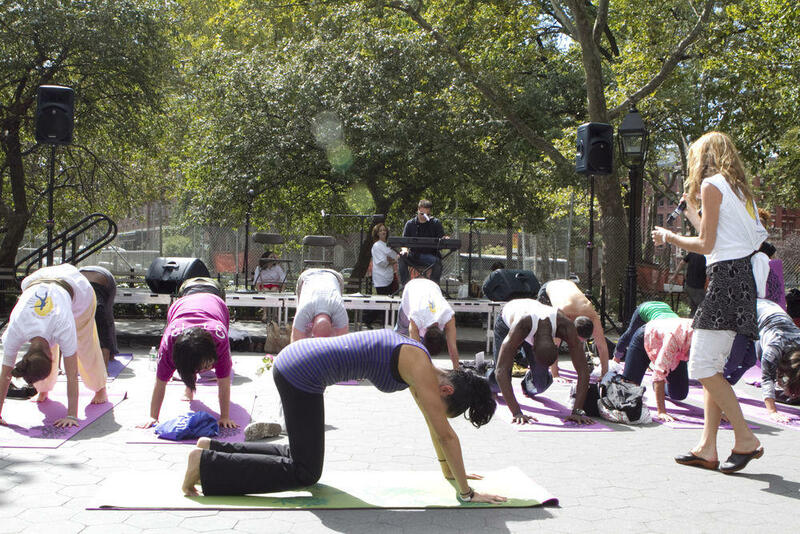 Check out our list of free yoga classes around the city!